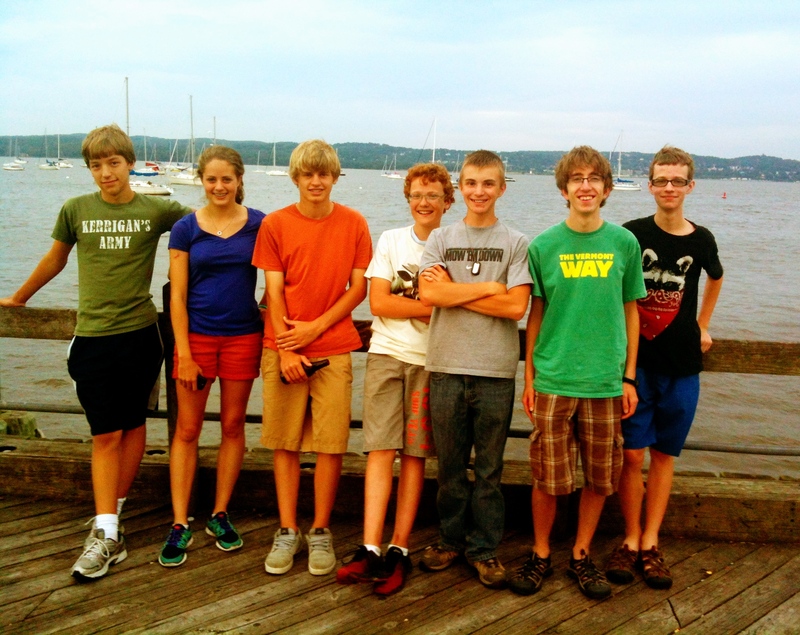 I just spent five days in New York City with seven teenagers from our church youth group — the Holy Cows — on a mission trip. Most of them had never been to NYC. We worked with a Quaker organization, the Youth Services Opportunity Project (YSOP). YSOP has connections with a multitude of service organizations across New York City, and, in two groups, our kids visited four out of the five boroughs that make up the city. Ranging in age from 14-17, the Holy Cows were prepared for the work assigned to them: soup kitchens, community gardens, food pantries, and day cares. Between the service work they do for their church community, everyone of these kids were on the ground in Waterbury Village in the hours, days and weeks after the flooding due to Tropical Storm Irene. Accomplishing the work was easy for them, and they performed their tasks diligently. What was overwhelming was the size of the city, the size of some of the soup kitchens, and the sheer number of people around them all day long. One group served over 1300 people in just over three hours, and when standing in Times Square, one Cow remarked that there must be more people there right then as there are in Waterbury. And he was right. Another overwhelming fact was that when visiting these different locations, nearly all of the clients served were of a different color than them. Black, Puerto Rican, Indian, Muslim, Jewish, White — New York is still the great melting pot. On the subway, one could sit next to a Hasidic jeweler, or could listen to the sweet sounds of an acapella group singing for their lunch money. These were experiences that these kids would never get in Vermont. For me, as a legislator, I was struck at the universality of the cause and effects of poverty, homelessness and mental illness. In conversation with the directors of the organizations we met, I heard the same things that I hear up here: lack of affordable housing, lack of jobs that pay a livable wage, how close people are to being on the edge of homelessness and the fears that we are all one step away from falling into the black hole, perhaps by no fault of our own. Everything in New York is bigger, to be sure–over 42,000 people use shelters on a nightly basis, and over 250,000 do not–but the issues remain the same, as do the solutions. And these issues are dealt with as they are here: locally. Each of the organizations I visited knew nothing of the others, for the city is too big for there to be a larger community. But they all knew that the issues they dealt with were important for the community they served. It was an eye-opening experience for the Holy Cows, and I’ll be interested in hearing how the sensory overload sugars off over the next few weeks. I will categorize my experiences as confirmation that the work we do at all levels in our community is of utmost importance and that it must be done by us all. And New York, where it is loud even when it is quiet, reminds us that with these issues, the work is never done, and it will take us all to contribute to bring even temporary relief. ← Here’s Our 2012 End of Session Report!